As you know, for the past five years, the global Anglican communion has been in crisis over sexuality. I said in a previous post that the crisis is really a clash between two churches, with two different missions: one driven by culture, determined to marginalise the Bible; the other driven by the Bible, determined to challenge culture. The battle between the two churches has reached Episcopalian proportions. Robert Duncan, the Bishop of Pittsburgh, has led the conservative Anglicans in the USA, who are opposed to the denomination's official policy of sexual permissiveness. On Thursday Sept. 18, he was officially deposed from his office in The Episcopal Church ("TEC"). He remains a Bishop with the Province of the Southern Cone, in fellowship with Archbishop Gregory Venables, who has also been an outspoken defender of a Biblically orthodox stand on sexuality. This deposition was carefully planned by the Presiding Bishop of the TEC, Katharine Jefferts Schori. 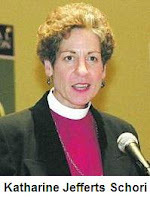 The first woman Primate in the history of Anglicanism, she has been instrumental in advancing the agenda of sexual permissiveness within the Anglican church in the USA. As far as I know, her actions have been totally within the letter of the law (but I'm no expert on American Episcopal canon law!). But this deposition indicates that the American Episcopal hierarchy is implacably hostile to anything remotely resembling orthodox, Biblical Christianity. They are totally unwilling to compromise their mission of radically revising the Christian faith to make it palatable to (post? )modern culture. It is with great joy that I welcome you alongside the ranks of St. Athanasius who, as Bishop of Alexandria, was deposed and exiled from his see. St. Athanasius did not waver and stood firm. History proved that his stance for orthodoxy was not in vain. I trust it will do the same for you! So please count it as honor my brother.